Nereus finances alternative energy infrastructure in India. 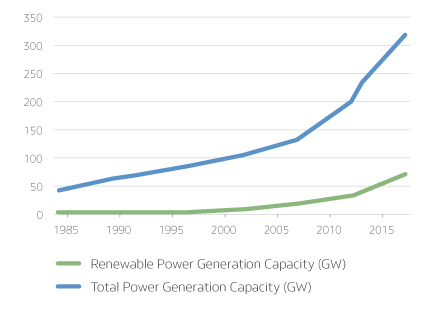 India’s economy requires an estimated 200 gigawatts of new power capacity by 2022 to sustain economic growth. Given the high cost of electricity, alternative energy has broad applications in India. 30% of India’s states have peak power deficits over 20%. 400 million Indians lack any access to power. Those who do have access experience outages an average of 19% of the time. India is currently the world’s fourth largest emitter of greenhouse gases. Its emissions are projected to increase to four times by 2050. India's energy crisis may spur the adoption of alternative energy. 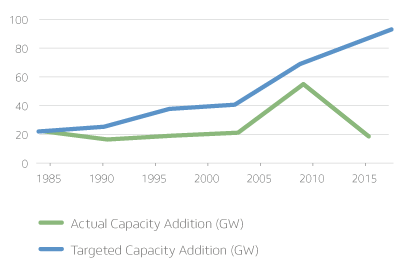 India requires 220 gigawatts of new power generation by 2022. Of this, 49 gigawatts is projected to come from renewable resources making India one of the world's largest markets for alternative energy. 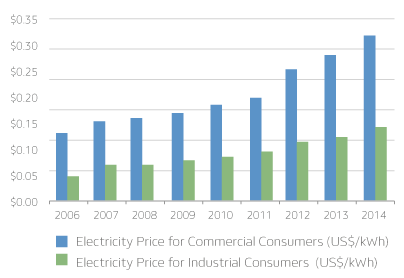 High power prices for commercial and industrial end-users in India allow alternative energy power projects to be economic independent of leverage or subsidies. Because India’s existing energy infrastructure is insufficient and inefficient, there exists an opportunity to reduce India’s reliance on centralized thermal power production through distributed, alternative energy generation. Nereus seeks excess return in the application of operational best practices to project development. Nereus is differentiated by the combination of a private equity team that has invested together for over a decade and a sector-specific operational team that has developed over 1,000 megawatts of alternative energy power generation in India. Nereus’ investment philosophy is premised on the belief that investors in illiquid securities must not merely derive returns from privately-negotiated market risk, but rather find excess return in rigorously diligenced, idiosyncratic company-level risk. Nereus seeks excess return in rigorously diligencing and pricing development risk in a market where asset-level returns are strong, but where execution can be challenging. Likewise, investing in dynamic markets rewards flexibility. Nereus’ invests across capital structures and return profiles to align interests and to provide companies with needed versatility. Nereus helps portfolio investments adopt the best practices of contractual risk mitigation, including power purchase agreements, engineering procurement, construction contracts, and technology supply agreements. Nereus drives certain high-impact aspects of project development within its portfolio to improve the risk-return profile of investments. Nereus' investments create positive environmental and developmental impact. Demonstrating that distributed alternative energy generation is economic in India may spur the type of widespread private market adoption that could alter India’s emerging carbon emissions footprint and spur economic growth in underdeveloped geographies. In addition to supplying power to communities with little to no access to electricity, Nereus’ investments in alternative energy power projects improve economic activity: developing local infrastructure, generating job opportunities, and providing additional means of income. India Alternative Energy Fund invests in private independent power producers where the use of proceeds from investments is the development, construction, and operation of alternative energy power plants in India. India Alternative Energy Fund invests across capital structures and return profiles to align interests between investors and developers and to provide companies with needed versatility. India Alternative Energy Fund seeks to catalyze the next generation of Indian IPPs; investments are underwritten from both project-level returns and the appreciation in enterprise value through the development of a scalable pipeline. Recently the combination of high electricity prices for commercial and industrial end-users in India and the falling cost of solar panels created a compelling dynamic–it can now be advantageous for commercial and industrial end-users in India to contract to buy solar power rather than buy grid power. India Solar Investment Trust provides construction financing for utility-scale photovoltaic solar power plants where the power generated is predominantly purchased by creditworthy commercial and industrial end-users in India. Indian Solar Investment Trust seeks to generate stable, low volatility, annual yields from the contracted sale of power. Nereus prizes its culture of informal collaboration and intellectual rigor. We believe in recruiting outstanding individuals of varied backgrounds and rewarding exceptional performance. While we are currently not actively recruiting for specific positions, we will consider creating a role for individuals with extraordinary qualifications and potential. To apply for a position with Nereus, please send your Curriculum Vitae along with a cover letter to careers@nereuscapital.com. A member of our team will be in touch with you should a suitable position be available. These articles represent the views of parties unaffiliated with Nereus. Nereus does not make any representation as to the accuracy of the information or opinions presented. The information set forth here (the “Website”) relates to general information about Nereus Capital (“Nereus”) to be provided to qualified employment candidates and current clients. Any information or material provided on the Website shall in no way constitute an offer to sell or the solicitation of an offer to purchase any security in any jurisdiction whatsoever or be construed as investment advice. While the information and opinions contained on the Website has been compiled from sources believed to be reliable, the owner of the Website and its affiliates (the “Owner”) make no representation as to the accuracy or completeness of any such information and accepts no liability for loss arising from the use thereof. Past performance is no guarantee of future results and there is no assurance that any investment objective of the Owner will be achieved. The content of the Website including all text, digital media, and code may not be reproduced, published, or distributed in whole or in part under any circumstances.